제가 평소 좋아하는 재즈와 펑크를 중심으로 만들었어요. 어렸을 때 힙합 디제이를 좋아했어요. 이번 믹스에도 그런 색깔이 좀 묻어날 겁니다. 5년 정도 되었어요. 지금은 온라인숍도 같이 운영하고요. LP를 만진지는 14년 정도 된거 같아요. 취미로, 다른 숍 직원으로 그리고 지금 제 가게를 운영하게되기까지요. 가게에서 주로 판매하는 음악은 어떤 건가요? 우선 전 중고만 판매합니다. 장르는 거의 전 장르를 다루고요. 팝, 재즈, 펑크, 소울, 락, 월드뮤직, 클래식 등 제가 좋다고 느끼는 건 다 가져옵니다. 특히 60~70년대에 집중하고 있고요. 둘러보니 한국 판들은 없는거 같아요. 일단 구하기가 어렵습니다. 수급문제만 해결되면 꼭 팔아보고 싶어요. 숍이 얼마 없으니 유통이 잘 안되기도 하고요. 아마 개인이 그냥 계속 갖고있는 경우도 많을 겁니다. 음악과 LP를 좋아하는 일반인들입니다. 중고 Vinyl 을 구매한다는게 돈과 시간이 꽤 드는 일인 지라 소비층이 아주 두텁지는 않습니다. 얼마 전 재미있는 통계를 봤습니다. 최근 바이널 매출량이 증가했다는 내용입니다. 물론 자세히 들여다보면 이야기가 좀 다르지만 말이죠. 먼저 그 통계는 미국의 이야기입니다. 90년대 CD가 인기를 끌며 바이널 매출이 급 감소하기 시작하지요. 최근들어 상승세가 있었다고 하나 80년대와 비교해봐도 매우 미미한 수치이죠. 우리와 같은 소매점에서는 그 상승세가 피부로 와닿지 않는 이유이기도 합니다. 그런데 지금은 CD도 마찬가지에요. 레코드숍이 없어지고 있는 추세이기도 하고요. 중고 바이널들은 어떻게 가져오고 있나요? 아무래도 중고이기도 하고, 그것들을 관리하는게 쉽지 않을 거 같아요. 맞아요. 아침에 출근하자마자 LP들을 닦아주고, 온라인 숍에 등록하곤 하죠. 어려운 일이지만, 중고레코드숍을 운영하려면 반드시 해야하는 작업이에요. 그 재미로 하는거구요. 일본 시장과 비교해서 한국은 어때요? 일단 일본은 꾸준히 잘 팔려왔습니다. 음악을 즐기는 사람이 많고, 매니아 문화가 발달한 터라, 히트한 장르 외의 것들도 고루 판매되고요. 음악듣기 좋은 가게 몇개 추천해주세요. 학쌀롱, 만평, 골목 앤 바이닐 그리고 서울 바이닐. 일단 이 가게를 쭉 운영해나가는 것. 더 많은 바이널과 다양한 매체를 다루고 싶기도 하고요. 많은 사람들이 이 공간에 대해 알아나갔으면 합니다. 감사합니다. 오늘 시간 내줘서 고마워요. 번창하세요! We’re curious about this mixtape! I made it based on the jazz and punk I like to listen to. When I was young, I enjoyed listening to hip-hop DJs, and so those details can be heard in this mix. How long have you been running your record shop? It’s been about 5 years, and now I also run the online shop. I think it has been about fourteen years that I have been introduced to LPs, as a listener, a staff member for other shops, and as the owner of my own. What genres are most prevalent in your shop? Which ones do you sell? First off, we only sell used records. For genres, we try to have as many as we can fit into our store. Pop, jazz, punk, soul, rock, world music, classic are just some that we currently have in stock. I try to bring all the records that feel right to have in the store. Nowadays, I focus mainly on records that came out in the 60s-70s. After taking a look, your store doesn’t have any Korean records. Korean records are hard to find– I would love to try and sell them if only I could supply them for the store. There aren’t many shops, and I think they are usually owned by individuals, not sold in stores. Who usually visits your store? Normal people that enjoy vinyls and music. Buying used vinyls is a time-consuming, expensive occasion so we do not have a big customer demographic. 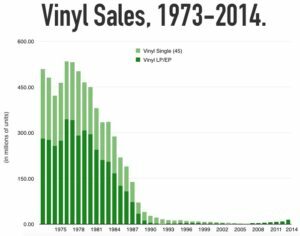 We read an interesting statistic a while back, and it stated that the demand for vinyls have actually gone up in recent years. Of course, when we actually read it, it’s a different story. First off, that story is specifically about the US. As CDs were very popular in the 90s, vinyl sales plummeted. Although same say they have regained popularity in recent years, it’s close to nothing when compared to the sales in the 80s. Small shops like us don’t see a huge impact from this, though. Where are you guys redeeming the used records? Since the records are used, isn’t it hard to make sure they are of mint condition? Yes, you’re right. As soon as I come to the office, I clean the LPs and register them on the online shop. It is hard work, but to run a used record store, it’s more than necessary. That is what I work for as well. Are there other hardships with running the shop? What are some of the great moments of running the store? What are some differences between the Korean and the Japanese vinyl market? More records are being sold in Japan, because of the mania culture deeply rooted into their culture. Many genres receive attention and popularity. To keep the vinyl store up and running. I would also love to handle more records and other mediums for music. I would love more people to get to know the store. Thank you. Appreciate for today! Good luck!